As any scholar will attest, one of the most annoying aspects of becoming an academic author is the incessant emails popping into your inbox on a daily basis offering to publish your next article for a knockdown price – in just a few weeks’ time, in a subject area you know nothing about, for a journal you have never heard of. Simon Linacre asks if the Blacklist of journals is actually worth the time and expense just to help eradicate this nuisance, or if there is more to it than that. In the world of academic research, there is an equivalent to the emails everyone receives supposedly from a Nigerian prince who needs to deposit $30m in your account for a few days, for which you will be paid handsomely. These are the emails that promise rapid open access publication for just a few hundred dollars, most likely in a very generic-sounding journal that purports to have an Impact Factor, even though you have never heard of it. As with the emails promising a generous slice of $30m, if it sounds too good to be true, then it probably is. And anyway, just how many gullible idiots pay these people? Well, if you are sat in a lab or department meeting, you could be looking at one. While it is difficult to establish exactly how many authors fall for predatory publishing, some recent investigations can put the problem in context. Firstly, a Federal Trade Commission (FTC) judgment in the US in 2018 against OMICS Group Inc and related entities found damages totaling over $50m were owing due to the predatory practices of the organizations over a four-year period, based on the operation of predatory journals and predatory conferences. This figure was arrived at following an estimation of the total revenues accruing from predatory practices – revenues from individuals paying for publishing and conference services that were below the expectations they were entitled to have from such services. In other words, that’s a lot of disappointed people. Finally, one story emerged about a German celebrity who died of cancer after trying a drug where the only evidence for its efficacy was published in predatory journals. The German team of journalists concluded that this final example was a warning for the dangers abusing predatory publishing to spread “false science”, citing examples where climate-change deniers had also published research in predatory journals. This highlights an often overlooked point – recently covered by Danish academic Tove Faber Frandsen in the article ‘Why do researchers decide to publish in questionable journals? A review of the literature’ – that far from being duped, many authors knowingly publish in predatory journals simply to tick the necessary box. This trend has also been noted by reports in The New York Times and other research journals like CMAJ and Journal of Scholarly Publishing. Cabells’ Journal Blacklist was several years in development and was specifically designed to provide researchers and their institutions a resource to help them avoid publishing in predatory journals and avoid the serious issues outlined above. The Blacklist uses over 60 different, weighted criteria to determine whether a journal exhibits predatory behaviors or not. It utilizes a team of academic and publishing experts to constantly monitor publishing practices and assess if an individual journal – not a publisher – is legitimate or not. 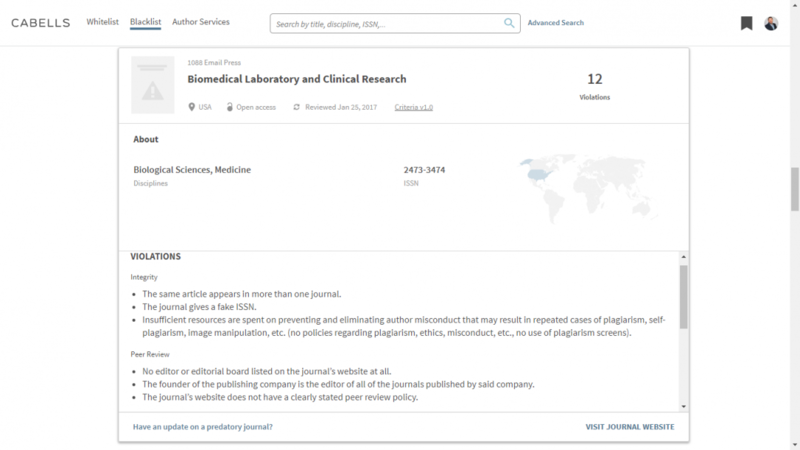 Many journals are left off the Blacklist where they are legitimate, but of low quality, and as such are not listed in the Journal Whitelist either. The process is transparent and often time-consuming, with all the criteria published by Cabells as well as the violations if a journal is listed. It has been almost two years since the Blacklist was first published, in which time it has grown from 4,000 journals to 11,000. In all that time, there have only been three requests from journals for a review. Cabells places a very high value indeed on the legitimacy and veracity of scholarly publishing, a value it believes it shares with academics the world over. It believes that the provision of the Blacklist is a valuable service to those institutions who believe they need to support their academics in a world of fake news, fake science and fake journals. Like any other commercial service, in order to recoup the costs of its investment it charges a fee for a subscription to the Blacklist which can be less than a single APC for many predatory journals, so universities can avert the problems caused by a faculty member submitting to a predatory journal just once to pay for the service. As we have seen, faculty can be unaware of the problems, or in some cases, they can be aware but make unethical decisions. Either way, librarians or research managers are often tasked with policing publications, and Cabells continues to develop the Blacklist to support them in their work. Hopefully, a subscription is a small price to pay to ensure public or institutional funding isn’t wasted and quality research is published in the right journals.